The Maltese Baron… and I Lucian is my book from Malta for the Read The World challenge. It’s a novel narrated by an old man called Lucian which begins with the return after decades of his childhood friend, the Baron. It is the story of their fractious relationship, and Lucian’s relationship with a woman called Katarina, cutting back and forth between the present and their youth. It has quite a successful unreliable narrator thing going on — Lucian portrays himself as an upright, moral, dignified man in contrast to the Baron’s promiscuity and vulgarity, whereas we can see that he’s a pompous selfish prick, and that the Baron, despite a few flaws, is practically heroic in comparison. Otherwise, though, it doesn’t have much going for it. The opening chapter has some prose which is so convoluted that it was practically incomprehensible, and I initially couldn’t tell whether this was supposed to be a way of characterising the narrator, some kind of advanced literary technique that I just wasn’t grokking, or just very badly written. In the end I decided it was a combination: Ebejer was trying to characterise Lucian as stuffy and self-important, but just wasn’t quite good enough to pull it off. The main narrative is more readable, most of the time, but it’s never any better than ordinary. 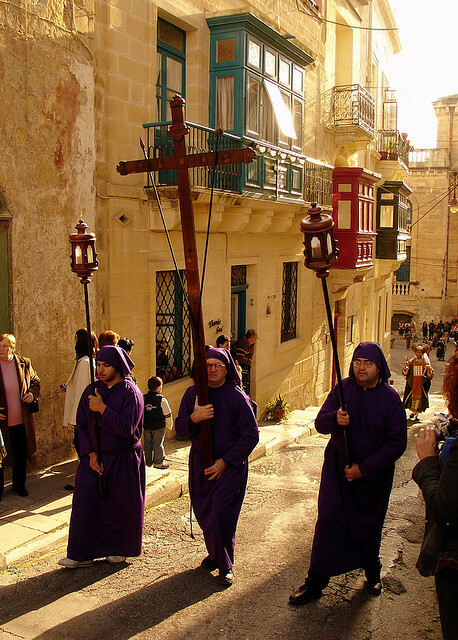 » Good Friday 2007 – Malta is © Antonio Caselli and used under a CC by-nc-sa licence. Hi, it’s interesting how many of these ‘read the world’ books seem to concern the past as much as the present, span a period of fifty years ago to now. As if the writers feel that the *history* of their country is more interesting than their country in itself. It’s certainly noticeable with the post-colonial literature that the first generation of writers often feel the need to tell the story of their country in fictional terms. Presumably it’s a need to establish a separate national literature of their own. Which I don’t mind except when it gets a bit predictable. Although to be fair, drawing on recent history for source material is not particularly unusual anyway. Call em perverse, but your description of the first chapter compels me to read it. heh. I know little enough about Malta, but for Gerald Durrelll, that miserable falcon, Barangelina’s brood setting up camp recently, and some reminiscences of friends who were RN and stationed there in the post-war period. On the Durrell thing, you’re thinking of Corfu, I think… unless you’re thinking of some episode in his life which I’ve forgotten. I don’t know much about Malta myself except that the whole island was awarded the George Cross after the war. And I think the Queen spent her honeymoon there, randomly enough. Maybe the Duke of Edinburgh was stationed there.